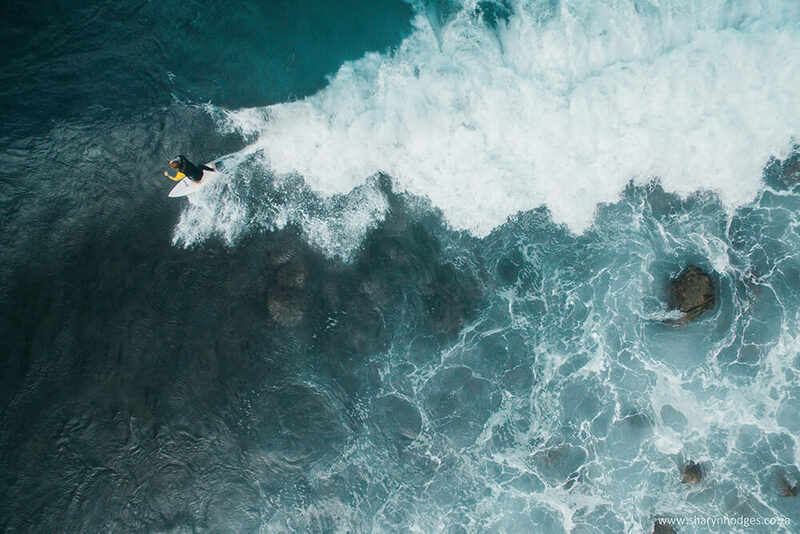 I can’t explain the happiness that goes through my entire body when my drone is switched on and I hear those beeps, as if to say to me, Sharyn are you ready to fly like a bird? For 17 minutes nothing in the world matters to me, other than just flying my “weapon of MASS destruction”. I can only describe flying a drone as human cheating. We are not meant to fly, but we can. And I love it. 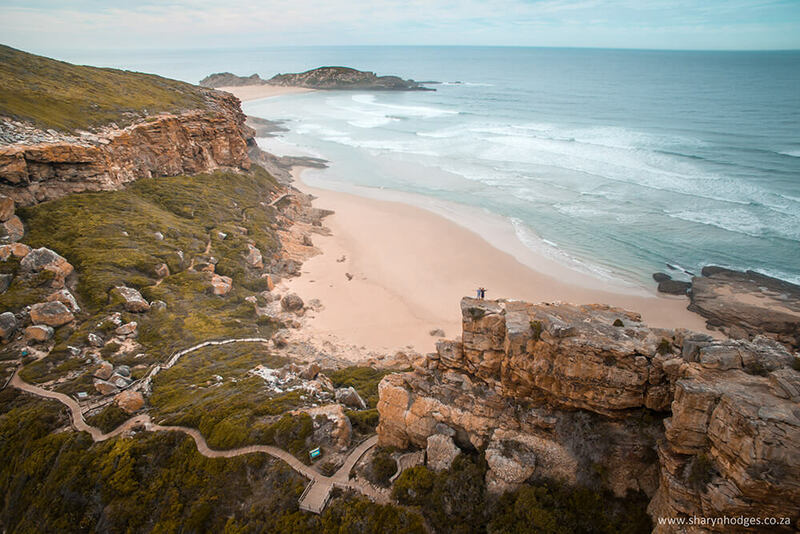 If you have read previous blogs of mine, you know that I live along the Garden Route, the most magnificent stretch of South African Coastline you will ever experience. 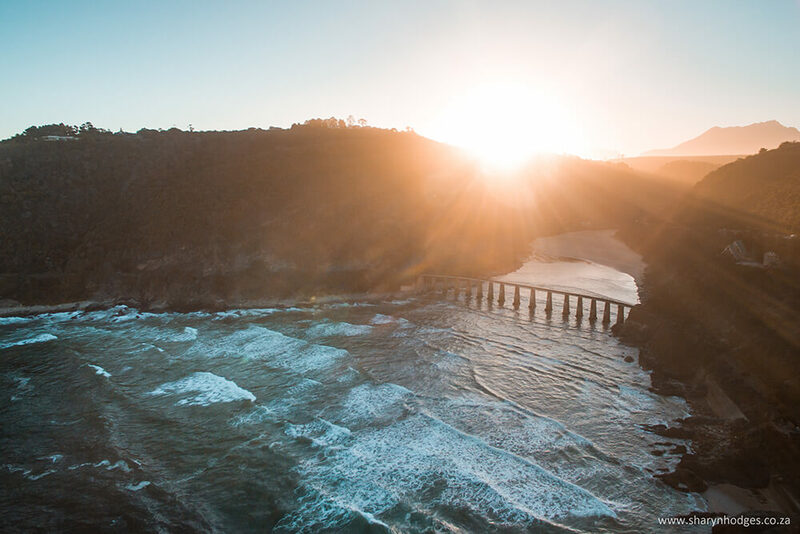 From flying above cliffs that seem to roll into our oceans, the rolling hills of the Knysna Forests, through the Outeniqua Mountains and watching those Southern Right Whales enjoy our colder waters to calf. Life is just beautiful from above. 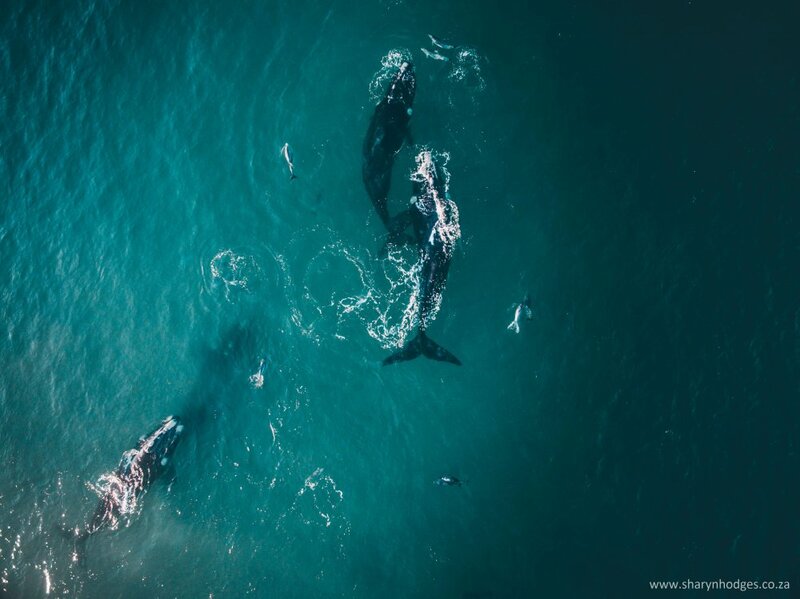 Southern Right Whales and Bottle Nose Dolphins – I believe photos like these helps us to appreciate the majestic beauty of these marine animals. 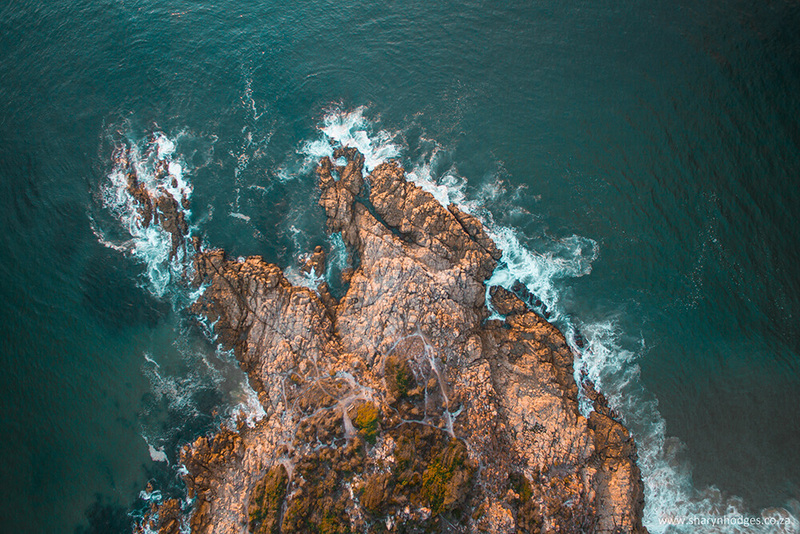 A drone adds so much more to my photography arsenal, I can capture unique views, height, maneuverability and camera angles that could only have been achieved with a Helicopter or Microlight. 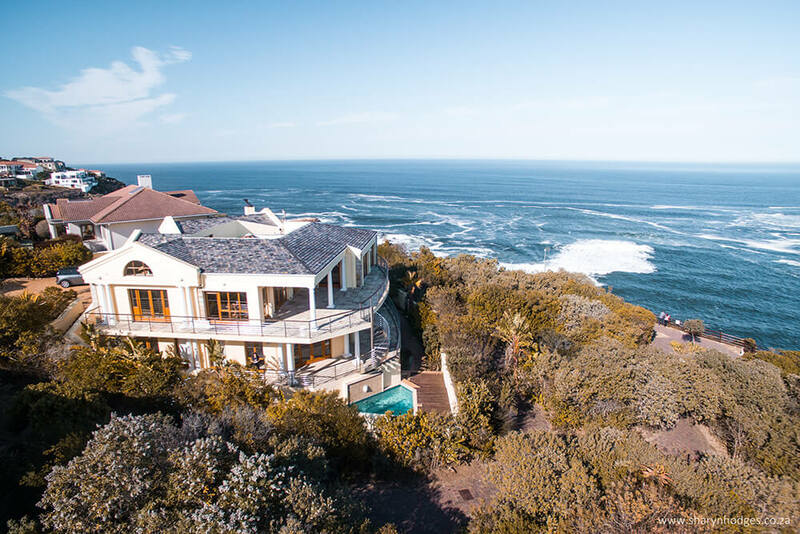 Just a couple of examples: Accommodation photography, I can offer my clients an aerial view of their property and the approximate distance of their accommodation establishment to and from the beach or town. Over the last year drone photography at Weddings has become a trend. I use my drone to capture still shots of the ceremony (if outside and safe to fly), location shots and to give another dimension of angles for the bridal shoot, imagine a bride and groom at the edge of the cliff and you get a shot from high above (for scale) and coming in for a close “on the edge” shot. Providing Scale – To be able to create these kinds of angels and perspective has added another tool to my toolbox. I always seemto read “negative” posts about drones and to be fair I think it is not fair on those that do adhere to the “rules and regulations” of flying a drone. Flying the drone with respect and thoughtfulness of our surroundings and people should be the order of the day, no matter who you are. Drones are everywhere and now that Amazon is developing a drone delivery system and NASA is throwing massive amounts of resources and money into the research of unmanned aerial systems. Drones are here to stay. Whether you like it or not. There is also a lot of “cheap” and easily accessible drones available from companies like DJI’s Phantom, Mavic, the M22 Quadcopter Drone, the Blade 350QX series just to name a few. With so many drones out there, the percentages of crashes and accidents increases. So safety and awareness is key to flying successfully. Where the famous Wedge Classic was held (was South Africa’s longest standing body boarding competition), I think we need to bring it back! These are my Do’s and Don’ts when flying your drone. These are not just for the safety of yourself, but for the people around you too. 1# Don’t fly over people! I cannot stress this enough. Anything can happen at any given moment accidents do happen, equipment does fail. People shoot drones out of the sky (not everyone thinks drones are amazing like us). You don’t want to be that drone pilot that seriously injures someone. So just avoid that situation at all costs. Doing Accommodation Drone Photography, once again giving new perspective for possible home owner buyers. 3# Don’t fly above 400 feet. This is when you are more than likely to run into airplanes, micro lights, and gliders. Even if you are less than 400 feet and you notice them, make sure you can ALWAYS see your drone and keep far away from them as possible. 4# Don’t fly over or close to airports. I think this one is rather obvious. 5# Don’t disable the GPS mode. When the GPS mode is switched off the photos will lack stabilization. 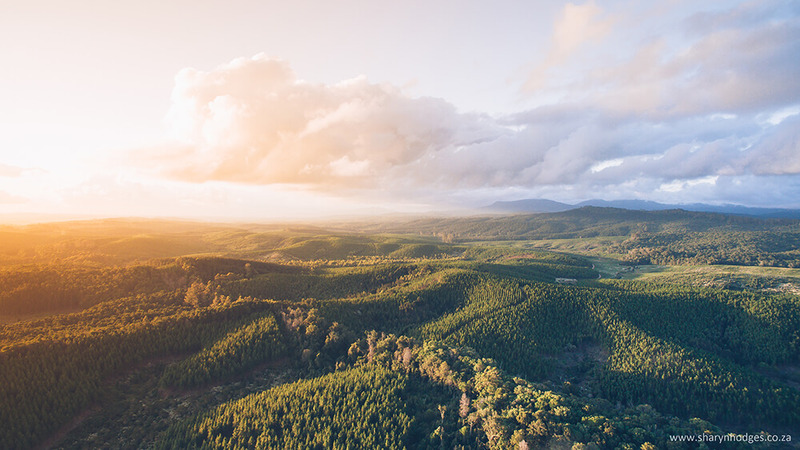 Capturing the sunset over the Knysna Forests. 6# Don’t just have one battery. These drone batteries don’t last long anything from 15 – 30 minutes to avoid checking potential freak outs (my favourite) because the sunset just got better or the whales started jumping, make sure you have an extra battery. 1# Fly in good weather. Yes this is a factor. Even if the sun is shining there could be gale force winds, your drone is light and fighting winds when landing can be rather interesting (trust me). The better the conditions the easier it is to fly. 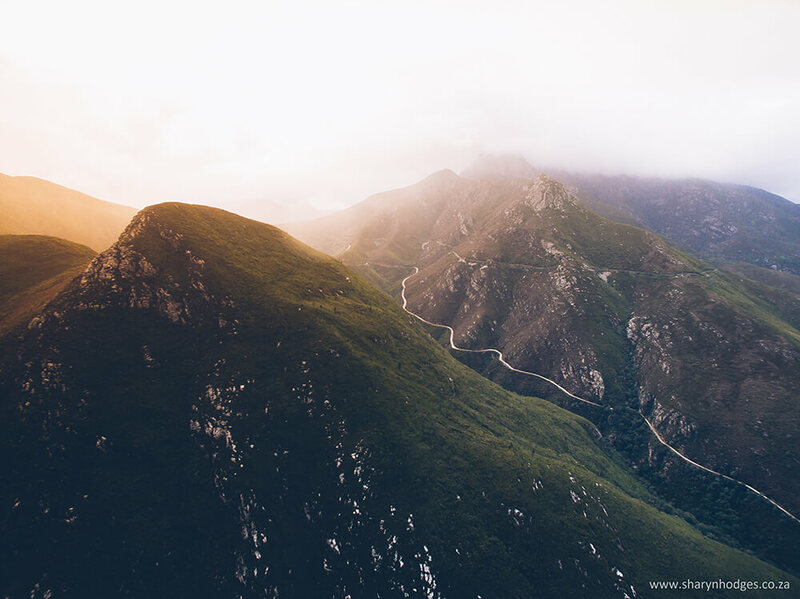 Sunrise through the Outeniqua Mountain Range, you can see the Montagu Pass on the right hand side. Flying through mountains can cause your drone to lose signal, so be careful when flying through mountains. 2# Line Of Sight…Very basic drone safety, especially in the beginning of your droning career. This just ensures that you know exactly where your drone is at all times and in doing so you are avoiding any potential obstacles. 3# Interference. This can be a number of things. Steel seems to be the biggest problem, when starting up the drone; it interferes with the magnetic compass of the drone. Trust me it is not easy trying to fly a drone around a construction site and the drone doesn’t know where it is going. Also flying around mountain areas can cause interference. Always check what warnings your are receiving from your drone and if in doubt, bring her home. 4# HAVE FUN! Every time I fly, I see something new. No sunrise or sunset is the same. No Wedding venue is the same. Each location provides me with a new opportunity to hone my skills and provide my clients with something new. A Drone “Top Down” is probably my favourite angel the drone generates. As mentioned above there are many drones out there and choosing one that both suits your needs and budget is vital. Another thing to consider is how you transport your drone. 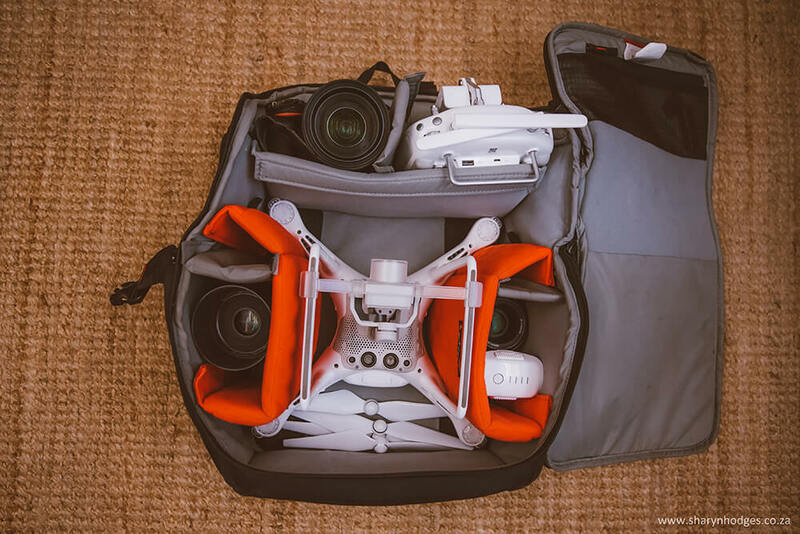 What I absolutely love about my Manfrotto Pro Light 3N1-36 Camera Backpack, is the fact that I have not only carry my drone (with extra batteries) but also my Nikon D750 and two other lenses, giving me the opportunity to fly and take photographs. Making this bag perfect for hiking and doing photo shoots where I am in total control of my bag (I don’t like people handling my bag). 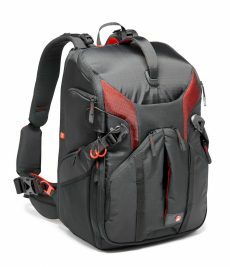 As with ALL Manfrotto products, the high quality materials and finishing’s are of the highest standard, taking in account not only the equipment, but the photographer who is carrying it. In conclusion, I am excited to see where Drone technology goes in the future, I really do believe it is limitless. I wouldn’t mind if I could order a double shot cappuccino and getting it delivered by a drone or my SD cards at a wedding malfunctioned, no problem, ill just order one and get it delivered. This is the future of these little beasts. But as I mentioned before, respect people, respect your surroundings and have fun, just go fly. When the sunrises over the ocean, my favourite moment of the day. Capturing what would have been impossible photography (and videography). 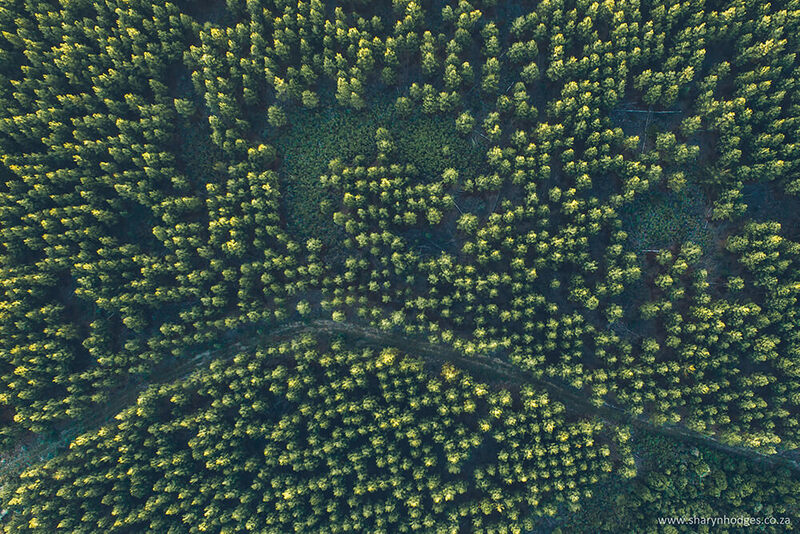 Another “Top Down” of the Pine Plantations in Knysna. Sharyn Hodges likes to describe herself as “just lucky”. 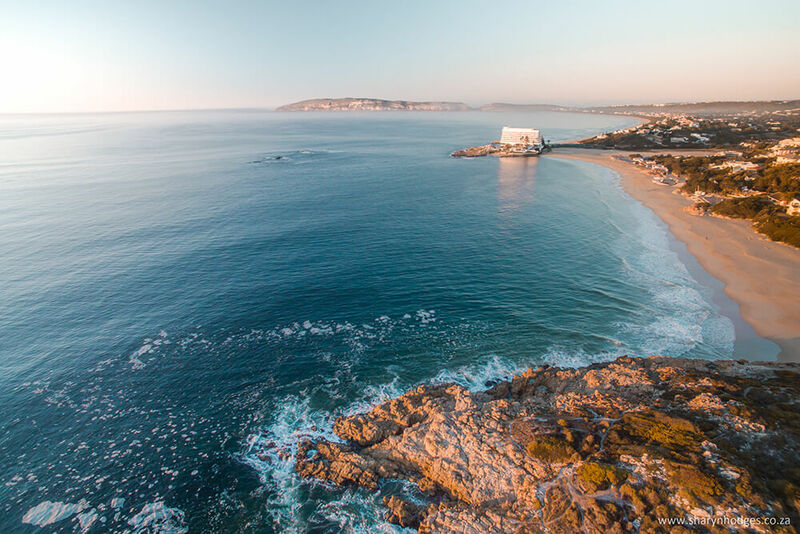 Home is Plettenberg Bay, South Africa, a sleepy little sea-side village where the sun rises and sets in colours one can only imagine. She is inspired daily by nature’s ever changing canvas of textures, colours and patterns. 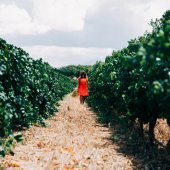 Her work varies from weddings and events to nature and landscapes, but her heart lies buried in the vast expanses of Plett’s beaches and the sheer splendour of the surrounding Garden Route and South Africa. Photography is in her veins; her mission is to capture those fleeting seconds of beauty which characterises this fragile adventure we call life. Her travel companion, Nikon D750.